Despite the dumping of snow we’ve received over the last couple days, protest season has sprung up again in Montreal. Last night, students marched in opposition to the Parti Québécois’ promise to index tuition fees, in a continuation of the “Manifs du Soir” that became a persistent staple during last spring’s student strike. Things began with roughly 60 demonstrators gathered at the Berri-UQAM Metro exit on the corner of Berri St. and Ste. Catherine St. E.
The crowd was immediately blocked from moving, with Service de police de la Ville de Montréal declaring that bylaw P-6 would be strongly enforced. The controversial bylaw states that protesters must submit their planned route to police prior to demonstrating, and are banned from wearing any face coverings, such as masks or scarves while marching. Because the group failed to provide an itinerary, demonstrators would risk arrest if they strayed from the sidewalk. 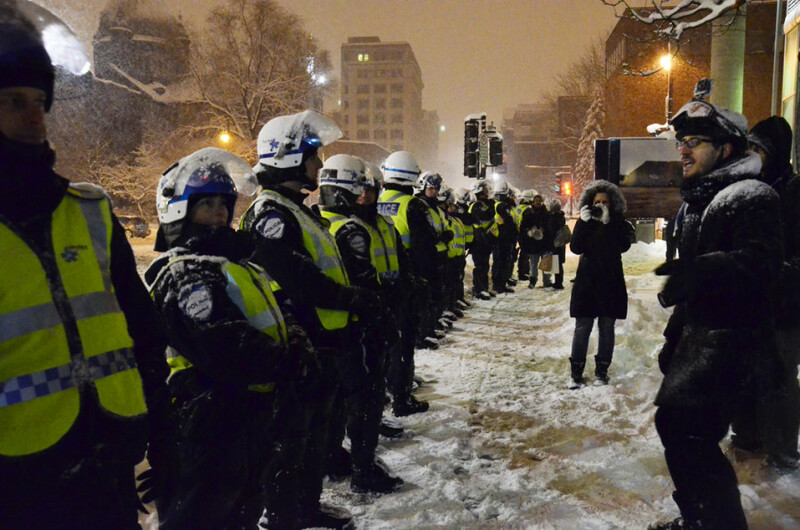 The SPVM repeated numerous times that, due to weather conditions, it would be dangerous for the protest to continue. Despite the dismal weather, demonstrators wearing identity-concealing scarves or masks would be arrested, they said over the loudspeaker. 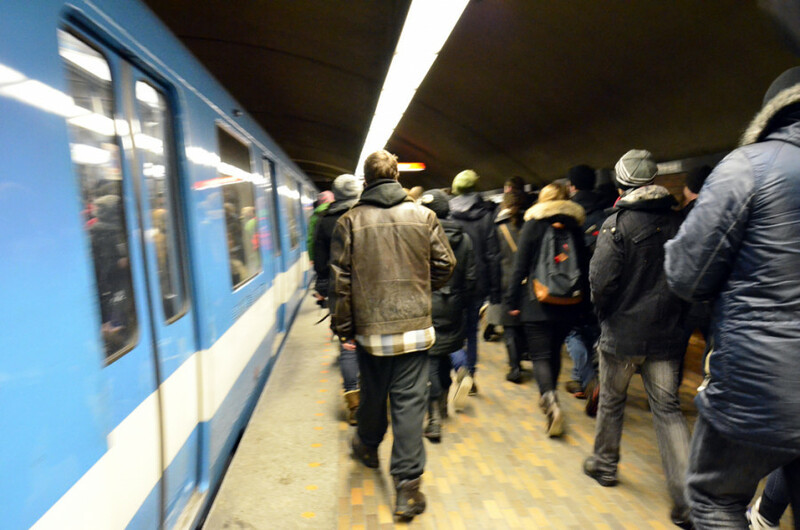 After about a half hour of standing outside the metro exit, with SPVM officers blocking the crowd from crossing onto the street, the demonstrators entered the Berri-UQAM Metro. While the SVPM remained outside the station, protesters crowded into an orange line train, eventually disembarking at Mont Royal. The march headed east down Mont Royal Ave., where at first there were no police in sight. After walking about four blocks, dozens of police cruisers trailed behind the crowd. While no altercations between police and protesters had yet occurred, the protesters encountered awaiting riot police as the march turned south on St. Laurent Blvd. The crowd continued down the block, with some straying to avoid the waiting SPVM officers. Riot police kettled the crowd just north of Rachel St., issuing 45 arrests under by-law P-6. This is the second time this week the SPVM have used the by-law to issue mass arrests during a demonstration, the first being at the annual Anti-Police Brutality Protest on March 15, which saw 226 arrests. The next Manif du Soir is set for March 22, a reprisal of monthly Days of Action seen last spring and summer, beginning at Place Emilie-Gamelin at 6:00 p.m.